Lately I've been feeling pretty overwhelmed with life. We have been extremely busy, we've had a lot going on with Joe's dad passing, our duties as matron of honor and best man in a wedding (bachelorette party/bachelor party planning, bridal shower, etc. ), and all of the other events that we have committed to over the last several and upcoming weeks. And don't even get me started on the Las Vegas tragedy, I can't even put words together to explain how that makes me feel, especially now having a child to bring up in this crazy world. Joe's work schedule is quickly picking back up to 6 days a week now that harvesting has started, it's getting darker earlier and earlier, and I'm feeling like I have no time to get my "stuff" done each day. My weekly attempt to clean my house has been put on the back burner since Labor Day, I've got garage sale stuff piled up in the spare bedroom waiting to be put back, donated, or stored, I've got so much dog hair swirling up in the every corner of my house that if you didn't know, you might think I have a whole pack of dogs at home. Time is absolutely flying and I feel like I'm falling behind on everything. On top of that Georgia has a new obsession, me. Yes, it's sweet and I love that she is so in love with me, but that girl can sense me getting out of bed when she is in a dead sleep and it's an immediate and very serious meltdown until mama returns. I've said this before, the Wonder Weeks app isn't always on point, but this time around it definitely is. 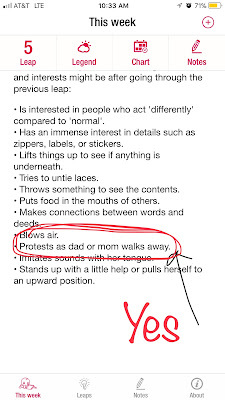 It currently says she "protests as dad or mom walks away" and it is 100% accurate. She continues to fight me on sleep but we are improving. Mama still has no plans to move her from co-sleeping/room sharing to her crib just yet. I officially had my first "bad mom" moment when I left her unattended on the couch on her boppy lounger, she rolled herself off the lounger and straight on the floor, luckily the play mat really softened her blow and I think it scared her more than anything. It was totally my fault as I was trying to multitask & have dinner fixed by the time Joe got home, her diaper bag packed and ready for daycare the next day, and (what I clearly wasn't doing) watch her at the same time. 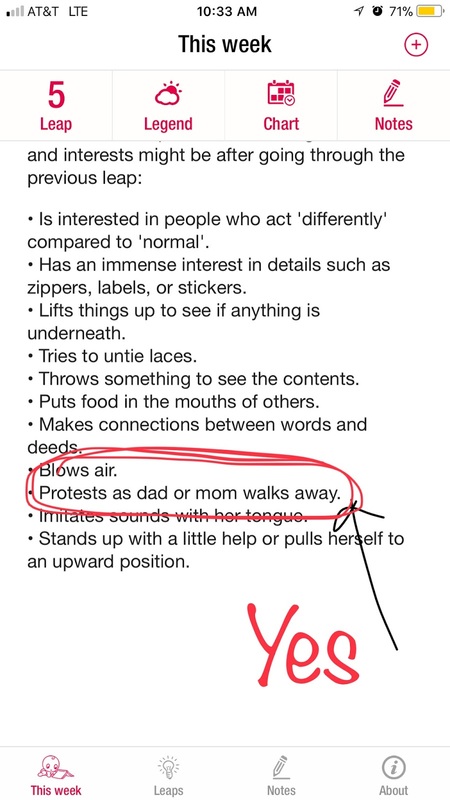 *insert palm to face emoji here* Of course this happened to her on the same evening that she was protesting sleep and food, but was exhausted and hungry…I couldn't help but feel terrible, but I was so frustrated with her at the same time I comforted her and handed her off to dad. It was one of those nights where you're not sure if you're better off dropping her out the window or snuggling her to death because she literally can't even. I'm probably making it seem like I'm doing a lot of complaining and that all my child does is whine & protest, however this is just one bad evening compared to dozens of good and fun nights that we typically have. Sometimes it's hard not to focus on the hard times, sometimes I have to remind myself that Georgia is a growing and developing 7 month old baby who is going to have bad days just like the rest of us. I have to remind myself that this is just one season of our lives that is going to quickly pass and I'm sure, like many of the other seasons we've experienced, I will miss it. Despite the hard nights, watching Georgia grow is truly amazing. She's making new noises and babbling like crazy. She loves to eat all the food, and wants bites of everything that mom and dad are having and of course we oblige. She's had everything from pears and avocado slices to pizza, pancakes, pasta noodles, toast, french fries, fried ravioli, and more. She is still nursing for the bulk of her meals, but I can tell that my body has already noticed she started solids because my supply has dropped a little bit. She is sitting in the cart like a big girl at the grocery store and Target rather than riding in her carrier. She loves to roll, she loves to sit, she loves to stand, and I'm hoping we see some crawling soon. She spends a ton of time in her walker and her exersaucer both of which she loves. As much of a challenge as these last few weeks have been and although there have definitely been some frustrating moments, that's what parenthood is about. I know things will get much more challenging and there will be much harder times than we are experiencing now. We are very blessed with a (mostly) happy and healthy baby. I'm slowly learning to let things like cleaning and laundry go longer than I ever would have before kids, I know I could probably get it all done but it would come at the sacrifice of time and moments with Georgia and that is certainly not something I am willing to give up because time is flying and she is changing so much right before our eyes. Are you embracing the current season of your life? Even the tough times are worth embracing and there is almost always a silver lining to be found in every situation. Girl yes, I am feeling the same way over here. Why don't you splurge on a cleaning lady to come and really deep clean your house just one time? That will take such a load off your shoulders. I find myself constantly cleaning and picking up and I realize I'm letting precious moments pass by with my daughter. I want her to remember me being present, and I really struggle with this. Hang in there! You're doing great lady! So nice to read about June's development! I posted a lengthy post in a mom's group on Facebook about this same thing earlier today. I feel like I'm drowning in stuff that needs to get done but am unable because of my toddler (I'm even a SAHM and can't get my crap together). I too was reminded to let the messy house and non important things go and to just spend that time with my sweet little girl that turned 2 in literally a blink of an eye. So yes, momma. The house can wait. Soak up that special time with your beautiful little girl because sadly she won't be little forever. A year ago, almost to the day, Olivia rolled off our very high bed into the carpeted floor (but no padding). I was nursing her and dozed off and she was almost a year old and very mobile. I felt awful. :( We all have our stories. They're so quick! And I feel you Mama. As a WAHM, I have to choose between getting my work done and cleaning. Not both. So one always suffers and I haven't been able to find that balance. You're doing a great job! I'm so inspired by your story and love following June's growth! This mom thing is tough, but we can do it! It's funny how when you used to look at moms and wonder why they did things certain ways. LOL. As crazy as my life currently is with two boys, 3 and 9 months, besides working full time, I also decided to launch a baby brand, so I can stay home with them, and have more time!